The weather on saturday for the start of the Brome Duck Festival was perfect and Knowlton was buzzing with the carnival atmosphere. The large tent in the Coldbrook Park provided shelter from the sun and was a great idea since last year we saw some rain; this year the ten ensured that everyone could enjoy the tables of goodies without worry. The festival is all about discovering new ways to enjoy the Peking Duck that has made Lac Brome famous over the years. 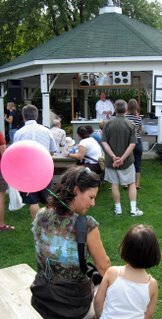 The cooking demonstrations were well attended and the chef created some wonderful looking dishes! Luckily there were duck sausages available and a steady line-up of folks who needed to bite into a succulant duckydog! The chefs presented tips and new ways of preparing duck and he explained step by step methods of creating fancy duck recipes with little effort. Samples of different wines and condiments to go with all manner of duck were presented under the big top and crowds milled about the tables under the tent as music played and a shuttle service took groups out to the Duck Farm. There are also inflatable rides for the kids to bounce around on and pony rides on the Sunday editions. The site is perfect for the whole family and the quiet village really comes to life during the festival. In Knowlton, even when there is a busy festival there is always a quiet place to enjoy a family picnic beside the water. Bring the whole family and enjoy a visit to another time in the Victorian village of Knowlton! When he weather is like this at the end of September the fall colors explode all around the center of the village and stores, terasses and boutiques are all decked out in their sunday best for the occasion. 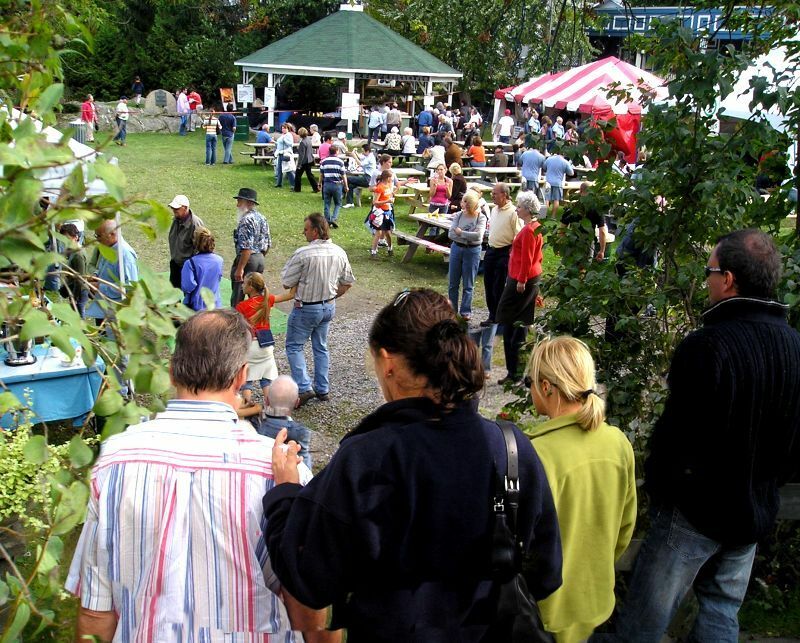 The duck festival is popular amongst visitors who enjoy the fall foliage at the same time as gathering for gourmet treats in the beautiful village of Knowlton. The Duck Festival continues all day Sunday and then starts up again Saturday September 29th and Sunday September 30th. Don't miss your chance to experience one of the best reasons to visit Lac Brome! The 7th Annual Brome Lake Duck Fest also known in French as "Canard en Fete au Lac Brome" is starting on September 23rd and the preparations of hard working organizers turning Knowlton village into a huge family oriented street party are sure to make this edition of the succulant festival one of the best ever. 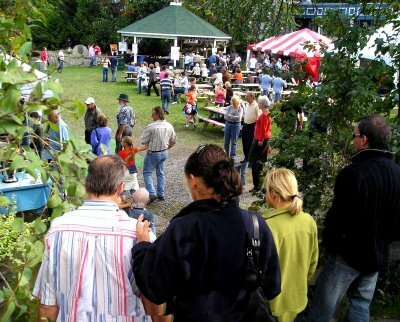 While the region of Lac Brome of the Eastern Townships is often associated withthe Big Brome Fair the Duck Festival is the best chance to really get to know the intimate side of the village of Knowlton. And let's not forget the ducks! The ducks are really the star of the show for the two-weekend extravaganza! People gather in Knowlton to taste the newest duck creations from world class chefs and to enjoy the signature hospitality that is is Knowlton. Famous the world over for its Brome Lake duck, the village of Knowlton (Lac-Brome) is already gearing up for its now famous fall street festival, the Brome Lake Duck Festival. 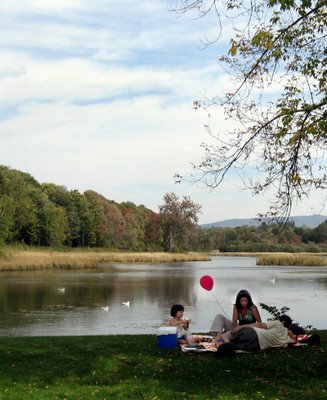 Knowlton, known as one of Quebec’s most beautiful villages, will transform itself over two weekends this fall on September 22-23 and continues the week-end of September 29-30. The hours will be from 11 a.m. to 5 p.m. Highlights of the festival include a farmer’s market, exhibiting local and regional goodies from maple products to local wines. Musicians, artists, entertainment and games for children are also on the agenda. Of course, duck specialties will be on the menus of local restaurants. This year’s festival promises to be a feast for the senses, both culinary and visual as autumn’s colours will be out in all their splendour. Organizers invited Marie-Andrée Leblond, a local artist, to design this year’s Duck fest poster. The poster is sure to become a collector’s item for those connoisseurs of both art and gastronomy. The poster will be for sale in many of the village’s boutiques and the Chamber of Commerce tourist offices in Brome Lake. One of the most popular events during the festival is the daily culinary demonstrations offered by the many different chefs of the region every hour between 11 a.m. and 5 p.m. It’s an excellent occasion for connoisseurs to learn the secrets of the art of cooking and serving duck. Knowlton, for its duck, and so much more! Sponsors of the Brome Lake Duck Fest include Canards du Lac Brome Ltée, Brasserie McAuslan, Hydro Québec, Finances Québec, IGA Gazaille, Emballages Knowlton, CLD Brome-Missisquoi, Town of Lac-Brome and the Chamber of commerce of Lac-Brome, Gaz Propane Rainville, Shur-Gain, Raymond Chabot Grant Thorton, AR Belley. A full program of activities will be available during the festival on-site. THE GREAT DUCK RACE IS BACK! Last September saw the first annual duck race take place in Knowlton and it was one of the highlights of the Duck Festival! 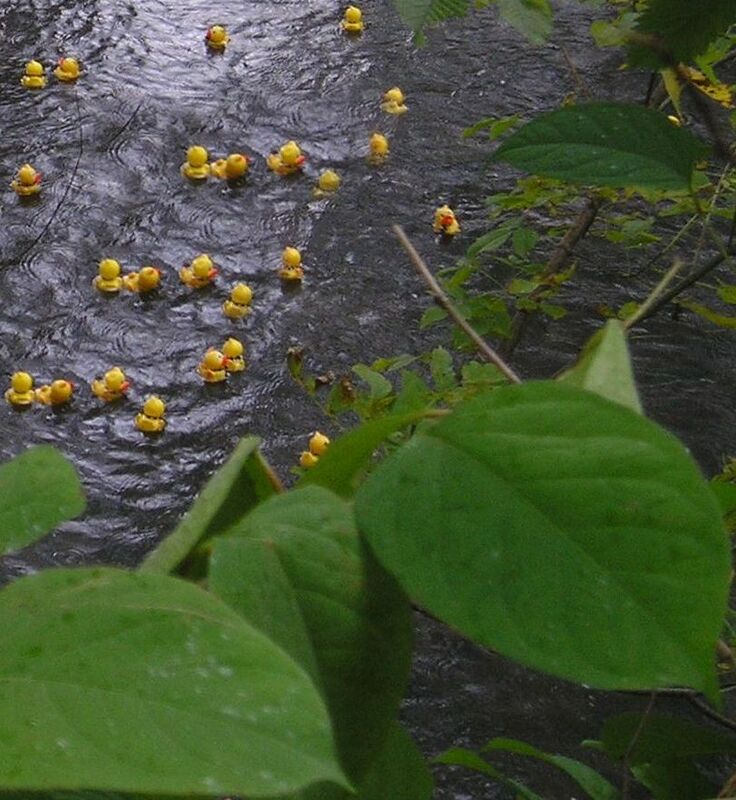 Crowds filled the Park at Mill Pond to watch as thousands of cute yellow ducks poured over the dam and drifted along the Coldbrook in a crazy race to the finish line. Kids and adults ran through the bushes following the yellow rubber duckies as they bobbed and wove the easy flowing brrok towards the finish line. People cheered, coaxed and hollared at the ducks as they floated towards the victory net! Relive the magic of last years Great Duck Race! The second edition of Knowlton’s Great Duck Race, organized by the Chamber of Commerce of Brome Lake, will take place on Sunday, September 30 2007. The spectacular Duck release is scheduled for 1:00 p.m. on top of the Blackwood dam of the Millpond at Coldbrook Park. Tickets are sold at $5 each and are bundled in booklets of 5 tickets for $20. The Great Duck Race will be the closing event of the Duck Festival and the Chamber expects to attract a great crowd into downtown Knowlton. 2.- « Shopping spree » offered by numerous Brome Lake’s stores ($ 2 500 value). The tickets can be bought at the Chamber’s office at 255-C, Knowlton Rd and at participating stores of Lac-Brome. For more information visit www.cclacbrome.com, call 450-242-2870 or write to info@cclacbrome.com .